Why Fish oil? Every cell membrane is made of fat! Diets containing healthy essential fatty acids equal everything from weight management to beautiful skin! Fish oil revolves around two omega-3 oils: eicosapentaenoic acid and docosahexaenoic acid. You may recognize them as EPA and DHA. Do you gag at the sight and smell of fish? That’s an issue! Luckily, our body has a back up plan already in place! It can be manufactured by alpha-linolenic acid as long as enough chia, hemp, flax and seeds are on your daily menu! Unfortunately, allergies, sensitivities and of course the yuck factor all influence our food choices! Eating healthy essential fatty acids means healthy fluid cells that are more receptive to insulin. The more insulin receptors on the surface of cells the lower our insulin levels. Low insulin means steady blood sugar levels, leaving us less likely to gain weight!!! Fish oils also stimulate leptin. Leptin is a powerful hormone that tells us we are full. Fish oils help burn fat. A bonus for athletes is the ability of fish oils to boost our body’s ability to store carbohydrates as glycogen (energy stored in liver and muscles called upon in training) rather than storing carbohydrates as dreaded FAT! EPA and DHA help reverse the negative effects of a diet lacking in omega-3’s. 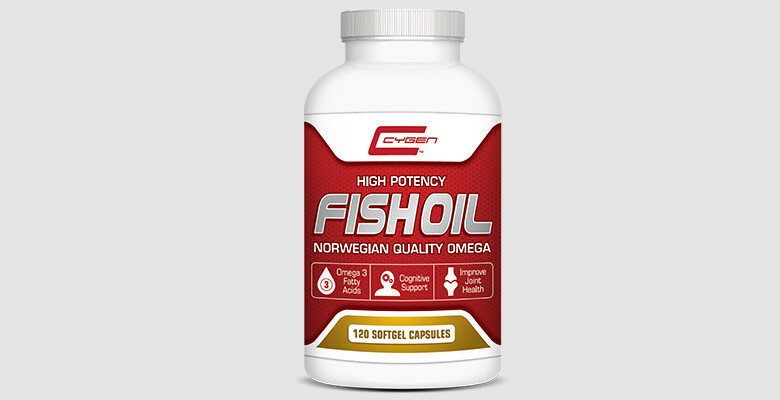 CYGEN FISH OIL uses cold water fatty fish, ensuring the richest sources of EPA and DHA. Reduced inflammation caused by muscle fatigue. In Dr. Natasha Turner’s (ND) book The Hormone Diet, she recommends supplementing with omega-3 fish oils to treat inflammation. She suggests taking 4 to 6 grams per day with food. Stock up on CYGEN! According to ISSA’s course textbook Nutrition: The Complete Guide, during an acute injury, decreasing omega-6 and increasing omega-3 is recommended. Dosing can be anywhere from 3-9 grams per day during injury. ISSA even extends the recommendation to normal healthy conditions. Stock up on CYGEN! Omega-3 (polyunsaturated fats) found in fish oil blocks biochemical reactions that cause blood to clot, making it part of healthy heart care! EPA has beneficial effects on blood pressure, cholesterol and triglyceride levels. Kidney function, inflammatory and immune response all show improvement when a diet contains fish oils. EPA and DHA also play a part in our retinas, helping convert light energy from the eye into nerve impulses. Whether you are feeling blue, injured or looking to reap rewards in and out of the gym, make friends with FISH OIL!! *Bucci L. Nutrients as Ergogenic Aids for Sports and Exercise. Boca Raton, FL:CRC Press:1993:20. Always consult your MD or ND before beginning any supplement. Please note: Fish oil is a natural blood thinner. It may not be advisable for those on certain types of medications. Not intended for pregnant or breast feeding women.